The Actor. Photographs by John Gossage. Published by Loosestrife Editions, 2012. She Called Me By Name. Photographs by John Gossage. Published by Loosestrife Editions, 2012. Loosestrife Editions, 2012. Hardbound. 96 pp., 43 duotone illustrations, 10x8". Loosestrife Editions, 2012. Hardbound. 36 pp., 18 duotone illustrations, 20x17". Over the past two years, John Gossage has published a staggering six books. This is an impressive accomplishment for any photographer. If you can keep up, he continually offers a rich trove of work to savor. His latest two books, The Actor and She Called Me By Name, offer dual looks into the past. The former is a collection of earlier work that has delightfully been brought back to life with new context and meaning, and the later is a collection of portraits of young art students. If The Actor is a look back to Gossage’s work as a young man, She Called Me By Name is a look backward to that time in his own life and a wistful attempt to capture youthful creativity. The Actor, by John Gossage. Published by Loosestrife Editions, 2012. 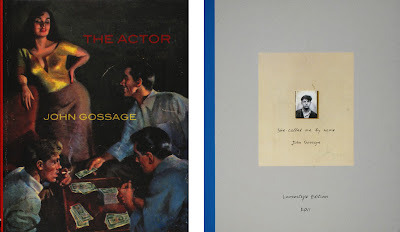 At first glance, The Actor is a cryptic and odd title for a photobook about banks until you realize that Willie Sutton, the famous bank robber, was nicknamed ‘the actor.’ While this provides the most obvious reading, Gossage himself is another ‘actor’ in this script. As the subtitle of the book states, the images are “other phantoms of my youth.” Although his images have always had their own formal clarity, he has always done so without a tripod or view camera. Gossage famously discarded the tripod long ago – the cursed three-legged beast – for the freedom of the handheld camera. Created in 1975, the images were set aside until Alec Soth’s enthusiasm encouraged him to revisit the work. It represents a road explored, a part played, a style explored, if not later set aside, only to be brought back to new life. The book is also dedicated to Gossage’s father, a character whose own company seems to suggest an equally checkered and adventurous past. While the work could easily be perceived as a bland ‘New Topographics’ inspired collection of banks and bank facades, all is not as it seems. Gossage has cleverly framed and re-imagined the work around the concept of thievery. Willie Sutton wittily summed up the obvious when he stated the reason he robbed banks was “because that is where the money is.” Although falsely attributed to Sutton, this wry answer cuts to the quick. In Gossage’s case, the answer is also obvious; it’s where the interesting pictures lay. Gossage may not be robbing banks, but he is certainly casing the joints. His photographs calmly note the relevant architectural details, sidewalks, lampposts and peer into the plate-glass windows. Like a thief, Gossage methodically probes the vernacular spaces of local banks yielding surprising results. The book’s yellow pages give the impression that it’s a cheaply assembled scrapbook of a meticulous bank thief – each potential heist carefully documented, planned and photographed. In an era of failed and corrupt financial institutions, the disappearance of local banks, too-big to fail and unchecked corporate financial monopolies, the images remind us of a time when saving was local and its institutions were idiosyncratic. Whereas The Actor is a discrete 8”x10”, She Called Me By Name is a sumptuous, if not a bit outrageous, 17”x20”. You’ll be hard pressed to find anyplace to put this beautiful book, but you’ll want to make room – even if it means clearing an entire coffee table or two. Despite its large size, the book contains a mere eighteen black and white portraits of young art students. Originally, many of the images were included in the book HERE…half blind, which was commissioned by the Rochester Art Center in Minnesota. Appearing as a supplement to the local Rochester paper, the work was later printed as its own book. While the book contained portraits, it was primarily composed of work typically associated with Gossage – i.e., astute explorations of the urban and suburban environment. The portraits added a surprising twist to the work and a degree of warmth. She Called Me By Name, by John Gossage. Published by Loosestrife Editions, 2012. There is nothing that particularly distinguishes the teenagers in the portraits as aspiring artists. They resemble the same scruffy and hopeful kids you might find in any local high school. While it is naïve to assume one can identify artists by their appearance alone, but there are always clues. In the small collection of eighteen students, there is the typically motley crew of metalheads, Goths and loveable misfits who might gravitate towards art classes – an oasis amidst the drudgery of standardized tests and the general malaise of high school. In the end, they defy such snide or easy categorization. They seem happy, eager to explore the world, and perhaps more than a little flattered by the attention from an artist like Gossage, who sees in them a little of himself. In his attention, Gossage offers hope that their dreams are not crazy and remain wholly possible, not only in the small world of high school, where such aspirations are often belittled, but also in the larger world they stand on the threshold of entering. Like all Gossage’s books, She Called Me By Name is full of delightful design details. The raw oversized cardboard cover of the book contains a small, weathered photobooth photograph of Gossage as a young man taken by Diane Arbus. When taking each other’s photographs, Arbus decided the photobooth could do a much better job. The result is present here. The back cover contains cryptic advice, perhaps given by Arbus herself to the young Gossage, and hastily scribbled down. While these notes may have been decipherable at some point in the past, the nonsensical advice offers vague words about Calculus and coursework. Inside the book there are also a series of handwritten dates beginning in 1964, the year Gossage turned 18, to the present. This simple list reads like an affirmation of the artist’s own years as an artist – each year a triumph for a kid who dropped out of high school to pursue photography and art. They demonstrate a life of commitment, as well as a promise to the young artists photographed within, that it’s possible and it’s all worthwhile.